Recently, I got a call from my brother detailing a conversation between him and another family member on my father’s side about me. The conversation between my brother and this particular family member came after several months of us not communicating following an explosive, draining intercommunal altercation. This is not the first time I have had to step away from, or cut ties with, my paternal family. For the majority of my life, I’ve only ever known this part of my family in one context: manipulative, abusive, and toxic. When I opened myself up to knowing them in another way—because I believe in restorative justice, growth, and healing—the weight of unchecked pain and agony went ignored and each moment with them, even with the laughs and smiles, felt like there rested an anvil on my chest. I can only describe my relationship with this side of my family like a toxic romantic relationship where either party leaves, returns, and leaves again—all out of love, but all with no regard for the toll it plays on themselves or the other person(s) involved. So when I received that call from my brother, with whom I am very close, where he told me about gut wrenching words this family member uttered about me, I felt immense anxiety. Shortly after we hung up, I had a panic attack. Not because I am unfamiliar with this type of hurt, but rather because I am all toofamiliar with this type of hurt. A pain that requires the abused to be in constant communication—be it voluntary or not—with the abuser(s), still feeling unheard, misunderstood, and unloved. My mom has been brave enough to share her story of being emotionally, mentally, and physically abused by my father and his family. That has been her cross and her calvary; the hill she has died on, been resurrected from, and been nailed to time and time again for the sake of making my brothers and me aware of who they are. And still, from my paternal family, gaslighting ensues, lies are told, and fingers somehow get pointed at everyone except the person in the mirror. This call was just another reminder of that. My brother told me that this family member told him she “did not like me” because I “think I’m better than them because I’m educated”; she told my brother that my dad never abused my mom, and then that she only saw him abuse her once; she called my brother weak and minimized our pain to “hurt people, hurt people.” This is textbook gaslightingand manipulation, and it is not new for them. She was right about one thing, though: I do feel that I’m better than them. But it’s not because I’ve received formal education. I am better than them because I am not a liar, an abuser, and do not wish to gaslight and manipulate women and children for the sake of covering up and excusing abuse. Growing up, I was always the kid who had to be the adult. At a very early age, I learned to advocate for myself, take care of and be responsible for others, and mediate struggles. In other words, I never really had a childhood; I had to mature much faster than others. This is in part due to the fact that fat and (unknowingly) queer kids are requiredto carry a load that is not their own, but it is also because of trauma that largely came from my paternal family’s role, or lack thereof, in my life. I vividly remember a conversation between my mom and I where she, in tears, apologized for me having to mature so early. What I didn’t understand then, but completely understand now, is that my launch into adulthood as a child was not her fault. It was the fault of my paternal family. Through their abusive actions, I developed abandonment issues, trust issues, chronic depression and anxiety, and much more, and all of this forced me to be more serious; to die on several crosses at once; to hold others when no one held me; to be the adult, the counselor, the friend, and the partner that everyone else needed but could not be to/for me. What I realize now is that this all played a major role in how I was socialized as a, then, fat Black boy. The socialization process is an ongoing one, and it is one that happens through various mediums and institutions. One of the most prominent institutions being the family. My father’s family inadvertently taught me that fat people are not supposed to be able to trust, only to be trusted; that we are never supposed to attach ourselves to others, only to be attached to—as our lives are only useful when we’re needed as punching bags and for other abuses. 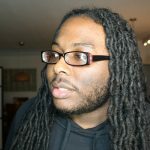 This is all especially true when you are Black, darkskin, and non-normative in the way that you perform your gender, as I did as a kid who was “hypersensitive” and often described as a “sissy.” The biggest lesson taken away from these experiences, however, was that fat Black kids are not allowed to be children. Our bodies, dark and wide, are too impure to ever grant us the space to exist as children. Without ever stating it outright, we learn that children have a particular size and a particular color, and when we unwind in the body that sits outside of these preconceived boxes, we are fully evicted and placed into the only next option available: adulthood. I think adults believe that adulthood is a prison. I believe that they think of childhood as a space for people who do not deserve to be imprisoned, and fat Black kids are not among that number. Instead of finding the freedom in which they assign to childhood, they toss our weighted bodies into the deep end and expect us to fight forever or sink trying. Familial abuse for fat Black kids is different in this way. They are not just wrestling with childhood pains, they are also fighting for their own lives and living with the responsibilities of an adult. Because they have the gall to exist, unabashedly, in a body deemed abnormal, they’re stripped of the childlike freedom they may have once experienced and thrown into the prison walls of adulthood. At an early age, fat Black kids are often shown that their bodies are worthy of being criminalized, that they don’t deserve life, and that abuse is what they must endure if they are to live. But in this new year, I’m taking back my freedom, finding a path through the trauma, and doing it all while still fat and Black. Because this weighted body is neither a prison cell nor is it a death sentence; it is abundant life and it is deserving of all freedom. Whether I communicate with that part of my family or not, I know now that there is freedom in the weight that rests on this body.